Last Saturday Benzo and I vowed to come straight home after church group and cook dinner instead of going out. We’re trying to be good for the next few weeks about not eating out much, since the past few weeks have been an eating-out extravaganza. My original meal plan was to make pizza on Saturday night, but we were planning to go over to the ILs for a late Father’s Day celebration on Sunday and MIL planned to have pizza. So we scratched the pizza idea and decided to make a pasta dish instead. This dish was actually Benzo’s idea, but I made it a reality. First let me explain the sun-dried tomatoes. I used chopped dried tomatoes from my garden last year. I dry them myself in the dehydrator and then store them in bags in the freezer. 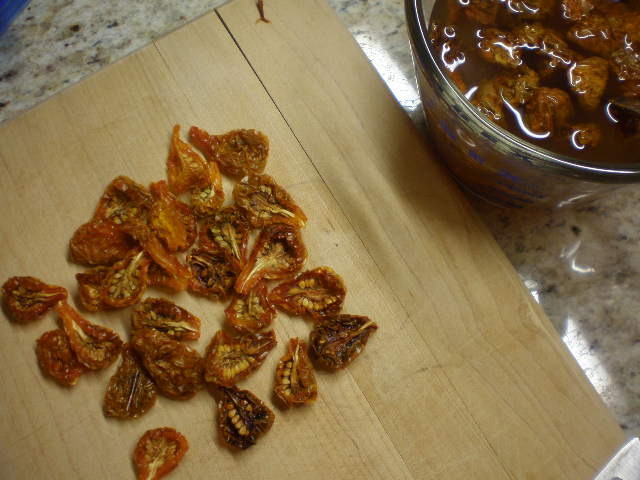 If using dried tomatoes like these that are not packed in oil, you’ll need to reconstitute them in hot vegetable broth first. What I do is heat up the vegetable broth (or boil water and stir in 1 tsp bouillon) and then drop in the chopped tomatoes. Let that sit for about 10 minutes or so while you make the rest of the meal. Alternatively you can use sun-dried tomatoes packed in oil. Just drain and chop. No need to reconstitute. 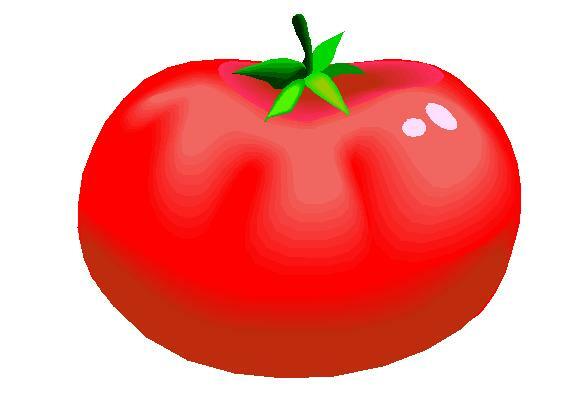 Also I should say that I didn’t measure my tomatoes, so the 1/3 cup is just a guesstimate. Use however many you want! Cook pasta according to directions. Reconstitute dried tomatoes if necessary. Meanwhile get all other ingredients ready. Drain beans and chop artichokes and garlic. When there’s about 5 minutes left in the pasta cooking time, heat oil in skillet over medium heat. When hot add garlic and crushed red pepper. Cook for about 1 minute, but do not burn garlic. Add garbanzo beans and artichokes and stir and cook for several minutes until hot. Add vegetable broth and sun-dried tomatoes to the pan (together or separately depending on what type of tomatoes you are using). Let cook for several minutes until hot. Add pasta and stir to combine. Heat for several minutes or until entire pasta mixture is hot. Voila! Benzo and I both really enjoyed the taste of this dish. 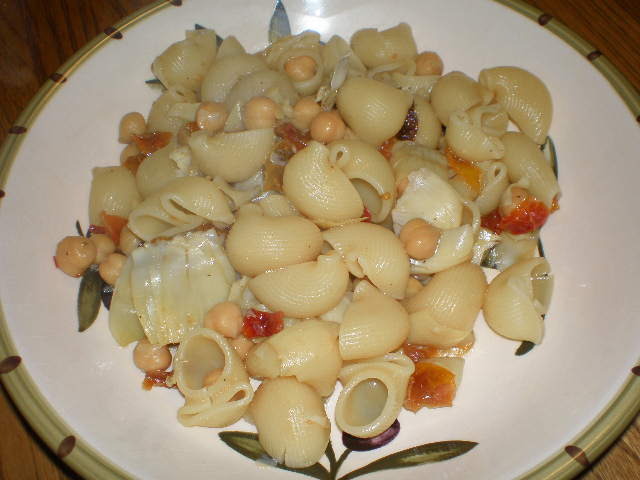 But the one thing I didn’t like is that this pasta dish is UGLY! It doesn’t really look that appealing at all. I think it needs something green, like spinach or even just a sprinkle of parsley. I like to have colors in my meals and this one just seems too beige and blah. Are you a pasta person, or do you shy away from pasta dishes? I think my love of pasta comes from all my years of running. Running and pasta have a long history together. Mmm that really does look tasty though it might lack some color! I LOVE summer pastas. Definitely fun to put all the garden goods into it. In fact, it’s in my meal plan for tomorrow! Can’t wait!